Tangled and True: more from klt:works! Kristin (of KLT: works) has a full heart. Due to plenty mentions of new babies, she has chosen to throw a shower. 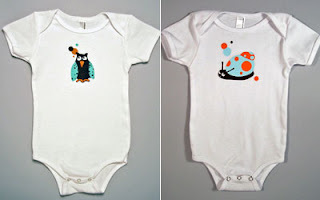 2 additional readers will be chosen on Tuesday morning to each win a set of two Flights of Fancy Onesies. Each Flights of Fancy Onesie (new for Spring 2007!) 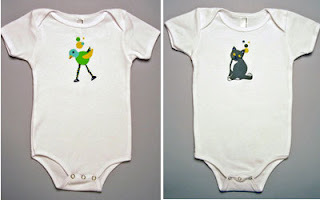 has our favorite klt:kids characters silk screened on a supersoft, white, 100% cotton, American Apparel onesie. Packaged in a small, clear plastic pillow box. Sold for $24 each. Again, a perfect gift or a perfect splurge for your own designer baby. Point: your chances to win have tripled. Keep commenting. Keep sharing the good news. And keep your fingers crossed. Oh wow. Sweet stuff and more of it. very cool! I especially love dewey and kiki. All four are so cute! I'd LOVE to win any of them!